Perhaps you sat and cheered for your favorite football team on a freezing winter Sunday afternoon or maybe you got caught without an umbrella on a cold, rainy day. Your first thought may be something like, “Oh, great, now I am going to come down with a cold.” Contrary to popular belief, although more people will suffer from colds during the fall and winter seasons, cold weather or getting chilled does not actually cause the illness. 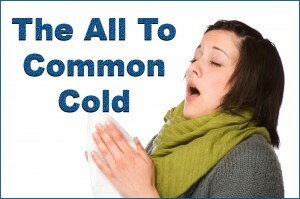 Colds are the result of over 200 different viruses. The increased likelihood of catching a cold during winter months has more to do with staying indoors in close proximity to others and the reduced humidity in which cold viruses are known to thrive. The highly contagious common cold is spread by direct contact through touching surfaces that have been contaminated with infectious secretions or by inhaling the airborne viruses. Cold viruses can live for several hours on surfaces such as phones, keyboards, or door handles. A cold virus takes one to three days to incubate and for symptoms to develop. Fortunately, the common cold will resolve itself within one to two weeks. Home remedies and treatments that alleviate the symptoms are the best plan of attack while your body fights the infection. Thorough and frequent hand washing is your first line of defense. This is extremely important as hand washing can destroy viruses that you may have touched. Refrain from touching your face, nose and eyes as these are common sites of entry for viruses. When possible, avoid close proximity to infected persons. Use disposable items such as cups and utensils if someone in your household has a cold. As modern medicine has yet to find a cure for the common cold, natural and home remedies abound. Many can provide temporary relief and get you on the road to wellness. Rest and stay warm. Resting allows your body to direct its energy towards your immune system. Drink plenty of fluids. Fluids help to prevent dehydration, help break up congestion and aid in expelling vital particles. Include tea with honey as tea has anti-inflammatory properties and honey contains mild antiseptic qualities and helps to soothe a sore throat. Go ahead and have some chicken soup. Recent studies suggest that Grandma was onto something. Chicken soup acts as an anti-inflammatory, inhibiting the movement of neutrophils, a type of white blood cell that increases mucus production, and contains cysteines which help to thin mucus, providing temporary congestion relief. As an added bonus, chicken soup provides easily absorbed nutrients and increases hydration. Salt isn’t just for seasoning. Using a saline nasal spray can reduce inflammation and swelling in the nasal passages, which helps to combat congestion and ease stuffiness. Gargling with warm salt water can temporarily relieve a sore or irritated throat. Blow your nose often and gently. Frequent clearing of your nose eliminates mucus rather than sniffling it back into your head. Gentle blowing keeps mucus out of the ear passages, where they can cause a secondary ear infection. Steam and humidifiers can help ease symptoms. Breathing in steam can break up congestion and help clear nasal passages. Use of a humidifier during winter months can keep nasal passages from drying out and developing tiny fissures that can make you more susceptible to airborne germs. Consider taking an echinacea tincture. Echinacea is believed to boost the immune system to help fight off infections. Studies show this form of echinacea will not prevent a cold but when taken at the onset of a cold it may help decrease symptoms and duration. Vitamin C. Taking vitamin C on a regular basis may not prevent a cold but by providing immune system support, it may help decrease the duration. Although having a cold can make you feel miserable, it pays to remember that colds are self-limiting and you will feel better in a week or so especially if you treat yourself with a little TLC. Echinacea Combination #2 by Genestra – This tincture contains synergistic herbs known for their anti-inflammatory, antiseptic, and antibacterial properties and are formulated specifically to assist with acute and chronic sinus infections. Bioflavonoid Complex by Douglas Laboratories – Each tablet supplies a combination of mixed citrus bioflavonoids that are rich in hesperidin and naringin flavanones, as well as quercetin and rutin. Vitamin A 25,000 IU by Thorne Research – Vitamin A is essential for a healthy immune system. It promotes a healthy GI mucosal barrier and supports the normal function of white blood cells, including neutrophils, macrophages, and natural killer cells. This entry was posted in Health & Wellness, Home and tagged common cold. Bookmark the permalink.